Over the years, Industry At A Glance has regularly reported on data generated from the Kansas Farm Management Association (KFMA) to provide some insight into decision-making in the cow-calf sector. State management association programs allow farming/ranching participants to obtain comprehensive analysis of their respective enterprises which comprise the farm operation. That information subsequently leads to establishment of meaningful benchmarks for comparative purposes – both from a production and financial standpoint. The KFMA data is especially useful from several perspectives. One, Kansas’ program is one of the largest in the country. Two, the data represent mostly mid-size (including both diversified and full-time) operations. Finally, there’s a solid track record across all the data enabling meaningful comparisons over time. The data outlined above represent five-year moving averages beginning with 1996-2000 and subsequently updated annually through 2012-2016, resulting from the most recent 2017 analyses and published in 2018. 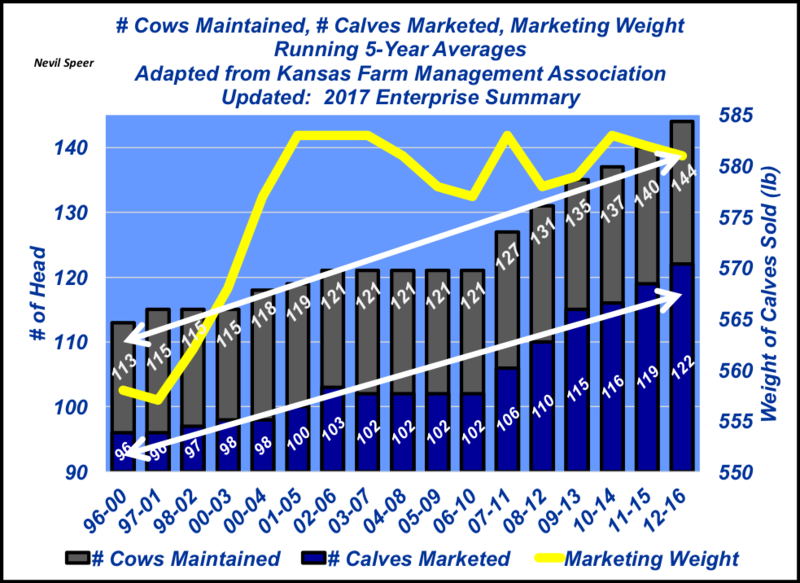 Analysis of the five-year moving averages avoids year-over-year peaks and valleys because of weather, markets, etc., and helps provide some focus on longer-run trends within the cow-calf sector. Related: 3 weaning methods compared; which one rises to the top? The marketing rate hasn’t budged. The relative proportion of calves marketed (or calf crop percentage – aggregately determined by pregnancy, calving, and weaning percentages, respectively) hasn’t varied through the years. The marketing rate has stubbornly hovered right around 84-5%. Seemingly, there’s been no major shift over time – one way or the other – in terms of either cow fertility or calf survivability. Weaning (marketing) weights have plateaued. Lastly, despite all indications of greater growth potential across the industry over time (e.g. bigger steer slaughter and carcass weight) marketing weight of calves hasn’t changed during the past 15 years. Producers continue to market their calves at the time they weigh 600 pounds – and with a 3% shrink, that translates to a 580-pound pay weight. How do you perceive these trends? Are they in line with your operation? Are they consistent with your perception of what’s occurring in the cow-calf sector? Do you foresee any of these trends changing in the coming years? Leave your thoughts in the comments section below.